On 12 December 2015 a man's body was found lying on the ground on Saddleworth Moor. He had died from poisoning. He became known as the Body on the Moor. And the struggle to identify him became one of the strangest mysteries. No mobile, no identification of any kind. No family or friends came forward. Maureen had a relationship with a man starting in the late 1960s. They didn't marry and she ended up marrying someone else but they stayed friends. For 40 years they saw each other regularly - she helped him in his garden and around the house. Then in 2006 he simply vanished from Maureen's life - upped sticks and left the country. All of the interviews here are taken from the new episode of the World at One's Body on the Moor podcast series by Jon Manel. Maureen believed he had sold his home and emigrated to California. The first she heard was when she received a call from his neighbour. She was told he was going to the US the following day. "I was very hurt by this," she says. She was unable to contact him because his phone had been disconnected. Since then, she says, she has thought about him often. Eleven years later she got another phone call. This time from the police. They had finally identified the body on the moor. They were calling because it was David Lytton, her friend. They knew little of his life and Maureen was able to fill in some of the gaps. Before he left in 2006, David had lived an apparently unremarkable life in south-west London, working as a croupier, a taxi controller for a mini-cab company, a baker and a train driver for the London Underground. Maureen says she met David in 1968. She was suffering from flu at the time but had ventured out to Finchley in north London to buy a stereo. It was the Last Night of the Proms and she wanted to enjoy listening to it at home. The following day, she says, he was back on her doorstep. "'Hello, do you remember me?' he said. And he kept coming round every day. He didn't leave me at all. We would even meet in the launderette round the corner and do our washing together." She describes him as a gentleman who liked to take care of her. He treated her to haircuts in fashionable Mayfair, where he was working as a croupier. But, although he was happy to treat his girlfriend, there were few extravagances for himself. His house in Streatham was sparsely decorated. There was no bed, just a piece of foam and a three-piece suite from a second-hand shop. Two items do stand out, though. Korans, one for upstairs and one for downstairs, she says. There was nothing in the kitchen - no fridge, no kettle, no food. "He said he wasn't entitled to comforts. Where he got that I don't know," she says. The police went on to discover that David ate all his meals at the same local vegetarian restaurant at the same time each night. He dressed smartly and was very particular and precise. Maureen says she could have predicted the clothes that he would be wearing the morning he was found: "M&S socks, white Jockey underwear, white vest, a singlet, cord trousers - navy blue, and round-neck sweater and an old mac that he probably had 30 or 40 years." His luxury was a pair of shoes made by the Swiss designer Bally. David grew up in the north London suburb of Finchley. He was born David Keith Lautenberg on 21 April, 1948 to Sylvia and Hyman Lautenberg. He was Jewish, his family having originally come to Britain fleeing from Europe. At some time, his immediate family changed their name from Lautenberg. He changed his name to David Lytton in 1986. 10:30 - Boards a Pakistan International Airways plane in Lahore and travels to London. He sits in economy seat 25C. 15:30 - Lands at Heathrow - he is met by a friend of 35 years and they have dinner together at the airport. Evening - Checks into the Travelodge in Ealing Broadway and books a room for five days. 09:04 - He pays £4.80 cash for a single ticket at Ealing Broadway and gets on the tube. 09:50 - At Euston station pays £81.60 cash for an off-peak return ticket to Manchester. 10:00 - Train departs, on its journey it stops at Stoke-on-Trent, Macclesfield and Stockport. 12:07 - Arrives on platform 6 at Manchester Piccadilly. At the station he visits a gambling arcade, Boots, WH Smith and buys an M&S sandwich. 13:00 - Leaves Manchester Piccadilly station on foot towards the city centre. There are a "missing 59 minutes" in the timeline - the police do not know how he got from the station to a pub 12 miles away. 14.00 - Walks into The Clarence Pub in the village of Greenfield, close to Saddleworth Moor - he asks the locals for "directions to the top of the mountain". 16.00 - As the sun sets across the moor, he passes two RSPB members walking down from the mountain. 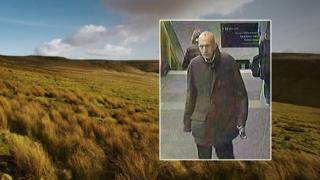 10:47 - David's body is discovered by a cyclist high up on the moor. The cyclist calls the police. Incident Log 936 reads "male deceased found in local beauty spot". Maureen and David met not long after he left Leeds University. He had gone to study psychology and sociology but, according to the police, he suffered from hypothyroidism and found it difficult to sleep at night. Instead, he slept during the day and didn't get the grades he wanted. When he returned to London he fell out with his family and moved out of his home. Maureen describes David as a "strange" man with some "quirky ways". "But I did like him," she says. "He was very particular, very precise and a gentleman. He was a lovely, lovely man." He didn't have any hobbies or particular interests that she knew of. But the police have discovered that David had an interest in different religions, including Buddhism and Islam. His last job was as a driver for the London Underground, one which he was well-suited to, says Maureen. "He enjoyed that - he liked his own company. He was a loner." Maureen and David had a pregnancy which ended in miscarriage. She says he changed greatly after that, he became withdrawn and quiet. Unbeknown to Maureen, David put his house up for sale in 2005. It sold on 4 October 2006, and he left for Pakistan on 6 October - not California as Maureen had mysteriously been told. His departure, it seems, was part of a plan - not a sudden disappearance. For Detective Sergeant John Coleman, this was one of the hardest cases of his career. He never dreamed it would remain unsolved for so long. Early in the investigation, he believed a titanium plate that had been fitted during an operation on the man's leg would provide the answer. This type of plate is only used in Pakistan, so police only needed to track down the surgeon. After months of searching, they drew a blank. But as the anniversary of the death of the man on the moor was approaching, there was a breakthrough. Initial inquiries had also focused on Ealing in West London, as it was here that the man was caught on CCTV. Because of the Pakistan connection and the fact that he had been seen walking from the direction of South Ealing, which is a few stops along from Heathrow Airport, DS Coleman had a hunch. He asked for all the passenger lists from Pakistan to be examined from the days before he was first spotted on CCTV in London. The task was to find someone who fitted the profile of a white male between 65 and 75, possibly travelling alone. At first, the person asked to do this failed to find a match. But as the anniversary approached, he revisited the case. "That's a hell of a piece of work. Thousands and thousands of people. The tenacity of that officer," he says. A match was found. The man was British, so police contacted the UK Passport Agency and obtained a copy of his passport photograph. Although the picture was 10 years old, there was a resemblance. "You can imagine the excitement in Oldham CID," says DS Coleman. CCTV images from Lahore airport came through on the anniversary of the death. The police had found their man. A DNA sample from a family member was needed for confirmation. Police checked the electoral roll in London. When this failed to turn up any leads, they turned to genealogy records. Eventually, they found David's mother Sylvia, who suffers from dementia and lives in a care home in London. The trail led to Maureen, who telephones the care home to check up on her former friend's mother every day. From David's visa for Pakistan, the police have been able to fill in some blanks. The found out that he set up home in an area called Hassan Town in Lahore. Neighbours say he kept himself to himself. One said he used to read all the time and visit the local internet cafe. "He never bothered anybody, though local lads teased him at times," one told the BBC. "He was nice to his neighbours and ate food sent by his next door neighbours. You would see him going for a walk in the morning, dressed in a tracksuit." Another recalled him returning from the hospital after he had the plate fitted. "His friend requested me to arrange for his food while he was on bed-rest," said Ejaz Ahmad. "So my family looked after him, our children used to bring him fruit and go to the bakery to buy him cake or pastry. So he was in bed for 15 to 20 days and then he started walking slowly." Another said that he was a Muslim and that David told him that he had converted in 1996. "Now, I don't know whether he said this in view of the treatment meted out to Christians here, as they are made to eat in separate pots from us, Muslims, but he definitely told me that he was a Muslim." The police say there is no evidence to suggest that he had converted to Islam. On Thursday 10 December, David Lytton sat in seat 25C on a Pakistan International Airlines Flight from Lahore arriving at London Heathrow at 15:30. He was met at the airport by a friend, who he had known for some 35 years. They ate a meal before the friend dropped David off at the Travelodge in Ealing. "His friend indicated that since David had not been in the UK for some time, he wanted to spend some time - weeks or months travelling around and seeing the sights," says DS Coleman. Although he booked into the hotel for five nights, David only stayed one. And in keeping with the mysterious nature of this story, police have been unable to locate the 18kg suitcase that he brought with him from Pakistan. And what about the "why". Why did David Lytton travel to Manchester, and then out to the renowned beauty spot? "I've got all the GP's records - I have records from university - there is no connection to Dovestones," says Detective Sergeant Coleman. At the inquest in Manchester, Coroner Simon Nelson said Mr Lytton "died of his own hand", but he couldn't be sure whether Mr Lytton had intended to take his own life.